Within the sacred pools appear seven apparitions. Our bewildered alien in the foreground is suddenly gifted with a difficult decision. Each pool holds a single choice – a dragon, representing supernatural forces; a tower, a signal of stability and power; a treasured pearl, signifying abundance and wealth; a kelp crown, representing victory or honor; a head, symbolizing a companion for herself; a snake, a totem of wisdom and knowledge; a shrouded figure, representing the need for illumination. It’s time to cut through the chaos, make some choices, and take some decisive actions. Dreams and good intentions are wonderful, in their place, but they’re useless without determination, resolve and hard work to back them up. Achieving your dreams takes effort, not just ideas. Make a start. Choose one thing at a time, and get it done. 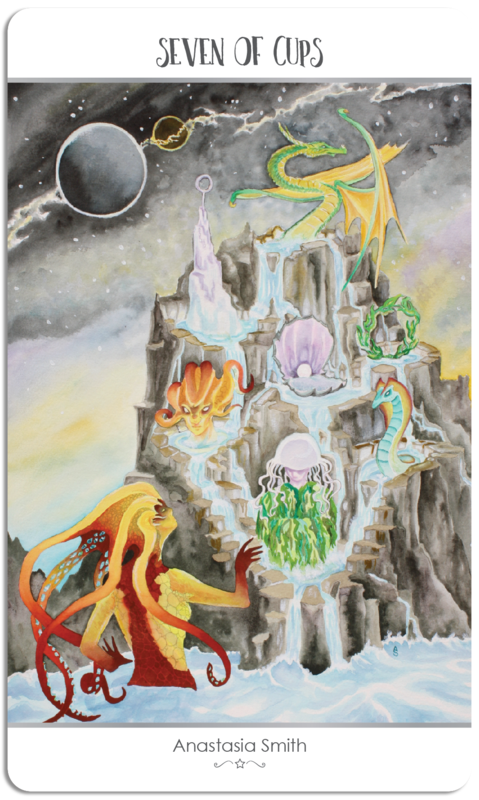 This entry was posted in Artist, Deck Review, Featured Card of the Day, General Tarot, Readings and tagged 7 of Cups, 78 Tarot, Astral, Tarot.